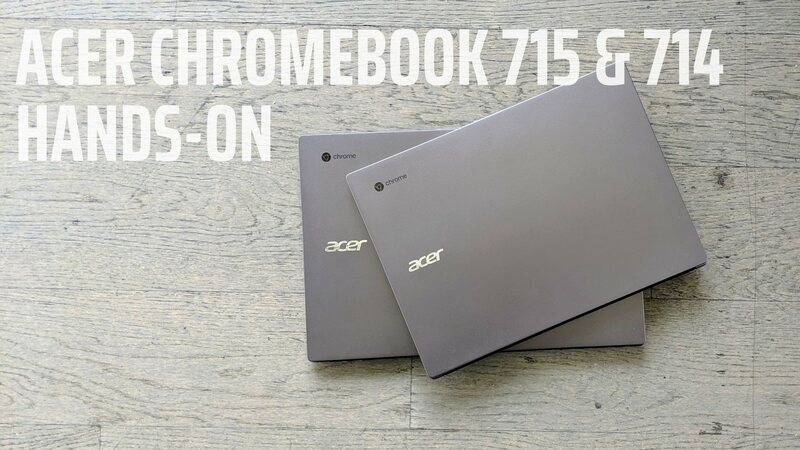 Today in Brooklyn, Acer unveiled the newest Chromebooks in their growing lineup: the Chromebook 714 and 715. We were at the event and got to spend a bit of time with both devices after the crowds thinned out a bit. From those few minutes we were able to really spend with both Chromebooks, I have a few thoughts. First, if you want to see all the specs and such, check out Gabriel’s article from earlier today. He gets into all the variations and technical specs there, but I wanted to really just get real-world impressions for this video. The most notable things here are the addition of a number pad on the right side of the keyboard for the 715 and the fingerprint scanner present on both the 714 and 715. We’ve not yet had a Chromebook with a number pad and we only have one other Chrome OS device with a fingerprint scanner: the Pixel Slate. Other things to note are the all-aluminum build, FHD anti-glare, touch display, gorilla glass trackpad, and backlit keyboard. Also notable is the seemingly upgraded keyboard in the 15-inch model. I don’t love or hate the keyboard in most Acer devices, but the keys on the 715 had a better travel and click than I expect from Acer. They honestly felt great. My only real gripe was the screen brightness, but having it up against the HP Chromebook 14 I had with me, it was a similar illumination. I think the lighting was a bit harsh and not characteristic of what you would normally find yourself working under. We hope to see these devices start rolling out around July starting at $499 and should see one in the office for review before then. For now, enjoy the hands-on!